A TRIP ACROSS THE NORTH AMERICAN CONTINENT FROM OGDEN TO SAN FRANCISCO. T. NELSON AND SONS, 42 BLEECKER STREET, NEW YORK, 1871. 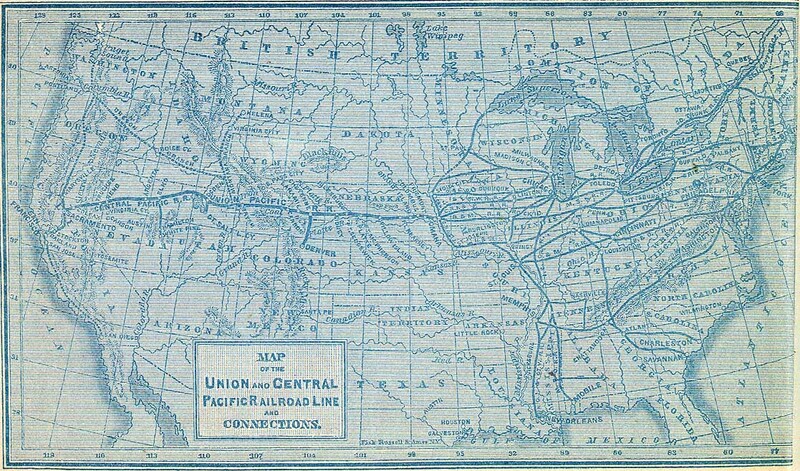 The Central Pacific Railroad forms a portion of the great line of rail which now traverses the American Continent from Omaha to San Francisco, and which, as Omaha is also connected by rail with New York, Boston and Philadelphia, literally brings the Atlantic and Pacific Oceans within a week's journey of each other. The Act authorizing its construction was passed in 1862, and immediately ground was broken at Sacramento, and the work began. 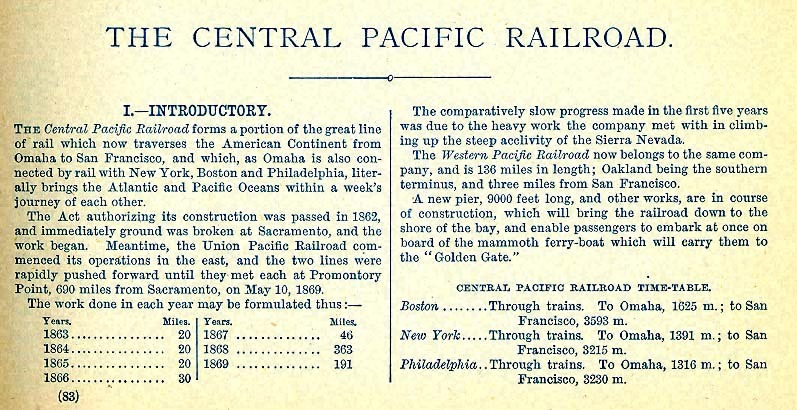 Meantime, the Union Pacific Railroad commenced its operations in the east, and the two lines were rapidly pushed forward until they met each at Promontory Point, 690 miles from Sacramento, on May 10, 1869. The comparatively slow progress made in the first five years was due to the heavy work the company met with in climbing up the steep acclivity of the Sierra Nevada. 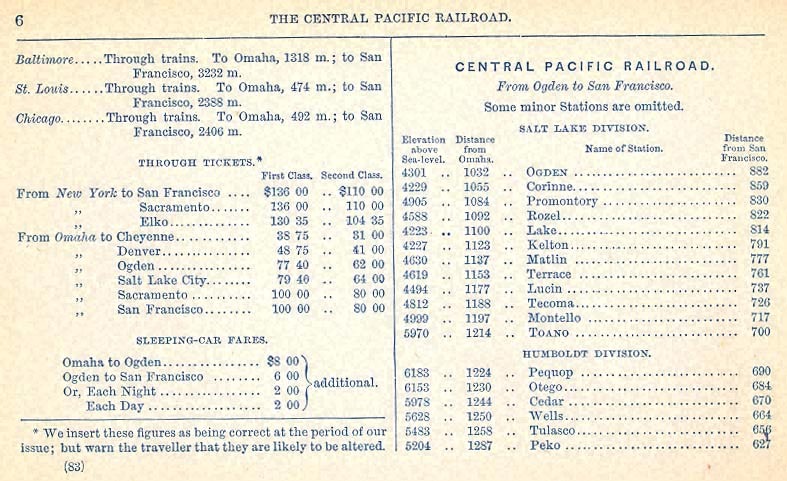 The Western Pacific Railroad now belongs to the same company, and is 136 miles in length; Oakland being the southern terminus, and three miles from San Francisco. A new pier, 9000 feet long, and other works, are in course of construction, which will bring the railroad down to the shore of the bay, and enable passengers to embark at once on board of the mammoth ferry-boat which will carry them to the "Golden Gate." Let us suppose that the tourist, in pleasant companionship with ourselves, has visited the capital of Mormondom, and all that he has cared to see in and around and about it; let us suppose that from Salt Lake City to Ogden we have reposed in a comfortable car, and that, arriving at Ogden, we engage for ourselves that locomotive luxury, a Silver Palace Sleeping Car, and resume our westward journey to San Francisco, the " Golden (late of the Pacific)." Our first station, 9 miles from Ogden, is Bonneville (1041 m.), elevation 4251 feet. The chief feature of interest here is the Hot Springs, whose clouds of vapour rise far away at the foot of the mountains, reminding one of the " cloud " which protected the Israelites by day on their march through the weary wilderness. They are mineral springs of a high temperature, and decidedly "malodorous." Hence we traverse a comparatively narrow belt of fertile land, with the Salt Lake, shining and shimmering, on our left, and on our right the bold mountains rising darkly, with their gaunt sides furrowed by the ancient sea-marks left by the waters as they sank gradually to their present level. Willard (1047 m.) is a Mormon town, or rather village, of some 900 inhabitants, situated in a district which exhibits the most interesting and instructive evidences of former volcanic activity. Corinne (1055 m.), the only Gentile city in Mormon territory. It lies near the west bank of the river, and a few miles from the Great Salt Lake ; a new, unfinished city, with, however, a few good and substantial buildings. Its population, we read in Crofutt, like that of all settlements founded by railway progress, has fluctuated greatly. Its advantageous position, however, cannot fail to raise it into a place of great importance, as it will form the depot of all the Montana trade. Coaches leave here daily on the arrival of passenger trains, carrying the United States mail and express to Virginia City, and Helena, in the territory of Montana. To Virginia City the distance is 358 miles ; to Helena, 482 miles. The latter has a population of 8000, and Virginia City of 1500 inhabitants. The territory is described as being almost as rich as California in mineral treasures, but both capital and labour are needed to turn them to commercial advantage. Its gold mines, however, seem to have been nearly worked out. Besides this department of wealth, its agricultural resources are extraordinary ; and its riverine valleys posess the finest grazing and farming lands in such abundance at to accommodate a host of agricultural settlers. The route to Montana passes up Malad Valley, and thence along the regular coach road to Virginia City and Helena. Blue Creek Station (1073 m.), at an elevation of, 4379 feet. Then we cross the Blue Creek itself, on a timber bridge 300 feet long and 30 feet high, and winding around several projections and mountain-spurs in a most sinuous course, we run along a trestle bridge on the left, 500 feet long and 87 feet high. And a famous bridge it is, though the builders of it don't derive much advantage from their workmanship and engineering skill. It was built by the Union Pacific Railroad Company, who brought up their track to Promontory, because they wanted to carry of as much as they could of the Government subsidy. When, however, due measurement was applied to the tracks of both Companies, it was decided by an Order of Congress that the Union Pacific had gone too far ahead, and the place of junction was transferred to Ogden. You will observe that the old track of the Union Pacific runs parallel to the Central, at a short distance, all the way to Promontory, the former junction-point of the two railroads. This was a wild place at one time. As many as twenty-eight deaths by violence occurred in the course of a single mouth. A stranger, entering a restaurant, sat down to a table occupied by two men. One of these took too much gravy, and the other, drawing his revolver, immediately shot him dead. The stranger sprang up to retire from such unpleasant companionship, but, under the threat of another shot was compelled to sit down and finish his breakfast, with the corpse of the murdered man beside him. We now reach Promontory (1084 m.), elevation 4905 feet, celebrated as the point where the junction of the two railroads, the Central and the Union, was effected ; thus completing an iron road of 1774 miles, and connecting East and West America. The town of Promontory is partly built of wood, and partly of canvas; it boasts of but one street. But it is a consolation to the traveller that it contains a " Club House" and a " Pacific Hotel." We pass over, with a word of allusion, the stations of Rozel, elevation 4588 feet ; Lake, and Monument, 4226 feet, where the air is impregnated with alkaline and saline odours from the Salt Lake. Monument Point is a grassy promontory, stretching far out into the waters of the Dead Sea of the West. We enter now upon the great American Desert, which geologists suppose to have been at onetime the bed of an inland sea. It is difficult to describe the desolation of its aspect, the barrenness of its soil. It is so thickly incrusted with alkaline dust, that at a slight distance you might suppose it to be a snow covered plain. But snow, it has justly been remarked, is far less intolerable than the alkali. Where the latter abounds, nothing useful to man or beast can live. It burns shoe-leather like lime. The infinitesimal particles floating thickly in the air irritate the throat and lungs as keenly as the steel-dust which cuts short the lives of Sheffield needle-grinders. Kelton, or Indian Creek Station (1123 m.), has an elevation above the sea-level of 4222 feet. Stages start from hence for Idaho and Oregon. Matlin (1137 m.), elevation 4630 feet, is situated on the outlying spurs of the Red Dome Mountains, whose varied outlines, as is common with sandstone, give a certain picturesque aspect to the otherwise dreary desert. Terrace (1153 m.), elevation 4619 feet. Bovine (1164 m.), elevation 4346 feet. Bunch-grass and sage-brush begin to show that we are exchanging the alkaline soil for something more congenial to vegetable life. Lucin (1177 m.), elevation 4494 feet. The watertanks here are supplied from springs which take their rise in the swamps of the Thousand Spring Valley. Tecoma (1188 m.), elevation 4812 feet. From this point the traveller obtains a very good view of the conspicuous landmark of Pilot Peak, which terminates the broken range of Pilot Mountains, and rises about 2500 feet above the surrounding plain. Montello (1197 m.), elevation 4999 feet. Toano (1214 m.), elevation 5970 feet. The town is composed of about 20 houses, but from its position with respect to the mines of Eastern Nevada, it has undoubtedly a future before it. We now begin to traverse a country of great beauty, where lofty mountain-ranges, 10,000 to 12,000 feet in height, and deep secluded valleys, rushing torrents, and grassy levels, combine in an infinite variety of delightful pictures. Pequop (1228 m.), elevation 6183 feet. The tourist will observe that we are gradually ascending the steep, acclivities of the Humboldt Mountains, whose uppermost flanks and crests are thickly clothed with snow. Otego (1230 m.), elevation about 6153 feet. Independence (1236 m.). Some pleasant springs lie close to this station; and in the country southward are Clover and Ruby Valleys, Ruby and Franklin Lakes, Goshoot and Snow Lakes, and the Ruby silver-mines. Wells (1250 m.), situated in the neighbourhood of the beautiful Humboldt Wells, which, about twenty in number, issue in the midst of a beautiful grassy valley, five miles long by three miles wide. Nothwithstanding their lovely situation, it is very probable they would remain unnoticed by the tourist unless his attention was particularly directed to them. The only indication of their presence is a ring of coarse grass around them, defined like a fairy ring. Standing on the bank of either basin, you note that it does not exceed seven feet in breadth, that it is perfectly still, and peculiarly smooth. Of course it has no current, and each of these fountains is more like a well, as it is correctly called, than any of the fountains poets love to describe. The water has a brackish and disagreeable flavour. It rises to the surface, and gradually trickles away, and is absorbed by the sandy soil of the valley. There is no doubt that these wells are very deep; and it is a reasonable suggestion that they are the craters of long extinct volcanoes, whose eruptions, at one time, created the vast body of lava found in the Cedar Pass. And lava is prevalent everywhere in the vicinity—lava in powder and decomposition, and lava in massive blocks, and lava in short thick currents. Blocks of sandstone and granite are mingled with them, and the whole scene is one of chaotic revolution. The Humboldt River rises in the Humboldt Mountains, and, after a course of about 300 miles, enters Humboldt Lake. Halleck (1284 m.), where government stores are deposited for Fort Halleck, a military post, garrisoned by a couple of companies. The adjacent valleys are rich, fair, and smiling. Peko (1287 m.), elevation 5204 feet. We now cross the North Fork, or northern branch, of the Humboldt, which is well stocked with fish, and continue our rapid progress down a valley fully five miles in width. Osino (1297 m.), " a signal-station at the head of Osino Canyon." Elko (1307 m.), elevation 5065 feet. Here the train stops for half an hour. At this point—and, indeed, all along the line—tbe traveller obtains interesting glimpses of what way be called the aboriginal life of the Continent. A traveller tells us that on one occasion he met there a large number of Indians of the Walla-Walla tribe. " Every squaw," he says, "had her face painted a bright crimson, striped with yellow." The ladies by whom he was accompanied " gave them small pieces of blue and red ribbon, which greatly delighted them. Tying the ribbon to the beads around their necks, they go back to the Pullman commissary [that is, refreshment] car, on our hotel train. * Having just finished breakfast," says our traveller, " I went into cooking apartment, and got a pail full of scraps. A rush was made for the pail ; but pressing them from it, I distributed its contents as equitably as possible amongst them. Some got three or four trout, others eggs, ham, beefsteak, rolls, corn-bread, &c. ; taking particular pains to give to any squaw who had a pappoose strapped to her back a double portion." Is it necessary to describe a pappoose ? Possibly it may be, for our less enlightened readers. Well, then, a pappoose is an Indian baby, who is strapped on a board about four feet and a half to five feet in length ; leather and skins of animals are nailed to it in such wise that it resembles a large ugly slipper. Into this slipper-like apparatus is inserted the baby, and strings are folded round and round the slipper and its inmate, from the chin to the feet ; the hands are even tied down, and of the living mummy you see nothing but the head. This head is protected from the sun by a little roof of wickerwork, to which are fastened rags of various colours, some yellow feathers, and a few beads, in the mother's natural anxiety to do something " tasteful " for her offspring. The entire apparatus is attached to the maternal head by a leather strap around the forehead. Elko once bore a very unsavoury reputation, but is improving in quiet and morality. A glance at a map will show the reader that the prominent position which this town occupies, more so than any station on the Central Pacific, east of Sacramento, is due to the fact that the road to the White Pine mining district branches off at Elko. This district is about 125 miles south of Elko, and almost due east of Virginia City, where the excitement in regard to the silver-mining in Nevada first broke out, and attracted general notice. The reputation of White Pine was achieved in a very short time ; in February 1864 the population of the district was reckoned at 400 people ; five months later it had increased to 20,000. Elko is laid out in streets,—Main, Commercial, Railroad, First, Second, Third, Fourth, and the like,—and these streets are lined with well-filled shops of every description. Many substantial houses have recently been built: as, for instance, a court-house, 40 feet by 70 feet ; and a school-house, 25 feet by 65 feet. The population is upwards of 3000. There are several hotels, of which the best is the Cosmopolitan ; and the Railroad Company has a very large dep0t here. Moleen (1319 m.), elevation 5065 feet. As we continue our gentle descent the valley opens before us, with all its shifting lights and shades, and pleasant combinations of wood and water. We cross Maggie's Creek, a stream which falls into the Humboldt about one mile from Carlin, and derives its name from a lovely " Scotch lassie," whose parents located themselves here for a time, while " recruiting their stock," in the old dull days when the emigrant, foot-sore and heart-weary, laboured up the ascent of the river. Carlin (1330 m.), elevation 4903 feet. The town is composed of houses built of sunburnt clay, wood, and canvas; several " hotels " and restaurants; and a population of about 900 inhabitants. The Railroad Company have some workshops here. Palisade (1339 m.), or Twelve Mile Canyon. The scenery of this deep rocky ravine is impressive in the highest degree. Bleak, bare, and broken cliffs tower on either side, while, somewhat beneath the traveller, the river rolls in a continuous frenzy, dashing its heavy spray on either side, and filling the air with the wild murmurs of a thousand discordant echoes. One of the most remarkable points is the perpendicular mass, 1500 feet high, known as the Devil's Peak. Cluro (1350 m.), elevation 4766 feet. Near this point the old " Emigrant's Road " crossed the river at the Gravelly Ford ; and at about four miles below Cluro the celebrated Hot Springs (sulphureous) rise from a hundred orifices. Be-o-wa-we (1358 m.), elevation 4690 feet. Shoshone (1368 m.), elevation 4636 feet. Argenta (1379 m.), elevation 4548 feet. Battle Mountain (1391 m.), elevation 4508 feet. Battle Mountain itself, so called from an Indian fight which occurred here some years ago, is a lofty mass, 1500 feet above the plain, whose base is washed by the river for itsentire length, from 50 to 75 miles. In the vicinity are some valuable copper and galena mines. Golconda (1434 m.), elevation 4387 feet, which accommodates the traffic of the Gold Run mining district, and which boasts of several thermal springs. At Tule (1445 m.) we reach an elevation of 4315 feet. At Winnemucca (1451 m.), elevation 4331 feet, we pause for refreshments, and to survey the old and new towns, with their combined population of above 600. The old town is on the low land, about 300 yards from the station ; the new town is built along the railroad, and contains about thirty buildings, of which four are hotels. Daily lines of stages run from this point to Boise City, 265 miles. There are several mines in the Winnemucca district ; and about 50 miles west of the town, across the Humboldt, lies the Mud Lake, which at high water is 50 miles long by 20 wide ; but in summer, though it has no apparent outlet, dwindles down to a small pool in a vast expanse of land. country which, at the outset, presents no very describable features. Rose Creek (1461 m.), elevation 4322 feet. Raspberry Creek (1472 m.), elevation 4327 feet. No topographer seems able to give a reason for the romantic names bestowed on these unattractive little valleys. Mill Creek (1479 m.), elevation 4228 feet. Rye Patch (1504 m.), elevation 4256 feet. Wild rye grows luxuriantly in the distance. We continue our descent past Oreana, 4182 feet ; Bridge Station (4008 feet), where we cross the Humboldt River; and Lovelock's (3977 feet), where we enter upon a belt of the Great Nevada Desert. Granite Point (1533 m.), elevation 3917 feet. Brown's (1541 m.), elevation 3925 feet,—a good point for viewing the Humboldt Lake, which measures about 35 miles long by 10 wide, but is, in effect, an expanse of the Humboldt River. Desert (1578 m.), elevation 4017 feet, is of the gloomiest character, and had Dante seen it, would have suggested to him new images of horror for his pictures of the " Inferno." Two Mile Station (1585 m.), elevation 4155 feet. At Wadsworth (1587 m.), elevation 4177 feet, we pause to take refreshment. The town is built of wood, and contains about 800 inhabitants, some 200 of whom are employed in the railway workshops. Within a circle of ten miles lie several profitable mines. Truckee, elevation 5845 feet, a city of 2000 inhabitants, on the north bank of the river Truckee, and in a finely wooded, country. We obtain here a picturesque view of the Sierra Nevada, or " Snowy Range." Its rugged, wild, broken, and lofty tops are everywhere capped with snow, whose dazzling unpolluted whiteness contrasts most vividly with the clear intense blue of the sky, which they seem to touch. At a distance, their emerald sides you would suppose to be embellished with wheat and other cereals ; but a nearer inspection shows that, instead of tiny stalks of wheat or barley, they are studded with giant pines, at least a century old. Most of the valleys and glens of the Sierra Nevada are very beautiful, and each is traversed by a flashing stream. The scenery is of a very majestic, in some places of an astonishing character. At one time the iron horse whirls us round the precipitious flank of a mountain, the track being suspended, so to speak, some hundred feet in the air. At another time we skirt the edge of a ravine not less, perhaps, than 2000 feet in depth ; the broad torrent at its bottom appearing to our dizzy eyes a mere thread of silver. The more exposed portions of our road are protected from the snow-avalanches of the mountain by colossal snow-sheds. These are firmly fixed to the mountain's side in a slanting direction, so that the snow falling upon it is not allowed to settle. They are constructed in a very solid manner, the supporting posts being of pine wood, 16 and 20 inches in diameter. One of these snow-sheds is 27 miles long; many are from half a mile to three miles ; and, altogether, they measure about 50 miles. Several pleasant excursions may be made from Truckee by the daily stages ; as to Lake Tahoe and the Donner Lake. The former is 12 miles distant. A good road follows the river bank, across green pastures or under shadowy pines, to Tahoe City at the foot of the lake. There is nothing to see in the so-called city, but much to admire in the lake, which lies in two states, California and Nevada, and in five counties. At some places it is 1500 feet in depth. Its shores ores are beautifully wooded, and many pleasant valleys open upon them. They are broken up into an irregular but picturesque outline by bays, coves, and creeks. Donner Lake lies about 2 1/2 miles north-west of Truckee; a mountain tarn, clear as crystal, with the slopes around it showing a noble growth of spruce, and fir, and pine. It is about 3 1/2 miles long, with an average width of one mile ; and its depth must be very great, for it has been sounded 1700 feet, and no bottom found. The disciple of Izaak Walton could find no more favourable locality for the pursuit of the piscatorial art, the waters being full of dace, rock-fish, white-fish, and silver trout. Then if be be equally an adept with rifle as with rod, the surrounding hills abound with quail, grouse, bear, and deer. A tragic association is connected with this lovely sheet of water. In the autumn of 1846, a party of emigrants, chiefly from Illinois, arrived at the Truckee River, accompanied by a Mr. Donner and his family, who were bound for one of the rich valleys of California. Encumbered by a large herd of cattle, he was either unwilling or unable to continue his course as fast as the rest of the emigrant band, and halted at the foot of Donner Lake, to take a night's repose. The weather, however was growing cold ; a black and threatening sky betokened the coming storm. In these days the road at Donner Lake turned to the left, following up the Coldstream brook, and crossing the Summit near Summit Meadows; a difficult route in fair weather, and an impracticable one in bad. The party who imprudently encamped at the lake that night numbered sixteen souls, including Mrs. Donner and her four children. During the night, the storm burst forth in all its fury and the snow fell in a continuous avalanche ; so that the emigrants found themselves surrounded in the morning by a vast expanse of snow, lying like a pall of death—such, indeed, it was to prove to some of them—over plain, and valley, and glen. After some consultation, it was resolved that all the party, except Mr. Donner, who was unwell, his wife, and a German friend or companion, should take the horses, and attempt to cross the mountain, while the others remained until the storm subsided. After a long and perilous journey, the horses and their living freight actually did succeed in crossing the mountains and reaching the valleys, where all danger was at an end. The storm continued several weeks, and rendered it impossible for any rescue-party to reach the three encamped at the foot of Donner Lake. In the early spring, as soon as the snow became hard enough for travelling, a party of brave men, led by one Claude Cheney, started in quest of the winter-bound, expecting to find them alive and in health ; for it was supposed they had provisions enough left to last them throughout the winter, including the cattle left behind—but the supposition proved incorrect, the cattle having strayed out of range. After a desperate effort, which required weeks of toil and exposure, the party succeeded in scaling the mountains and reaching Donner Lake. They came to the camp of the Donners, and, throwing open the rude door, entered. What a sight met the first glance which pierced the semi-darkness of the cabin ! There—before the fire—sat the Dutchman, holding, in a vice-like grasp, a roasted arm and hand, which he was greedily eating. With a wild and frightened look he sprang to his feet, and confronted the new-comers, holding on to the arm as though he feared they would deprive him of his repast. The disgusting, horrid sight almost overpowered these brave, rude men, used to scenes of blood and strife. The remains of the arm were taken from him by main force, and the cannibal secured for the time, while an examination disclosed a portion of the remains of the unfortunate lady whence the arm had been severed, frozen in the snow, but as round, plump, and fair, as if she were in possession of perfect health when she met her fate. The remains of Mr. Donner were found, and, with those of his faithful wife, given such burial as the mountain's would permit. Taking the Dutchman with them, the party sorrowfully retraced their steps, arriving in the valley in safety. The story, as told by the Dutchman, was this : That soon after the party left them in the fall Mr. Donner died, and they buried him in the snow. The cattle escaped, leaving them but little food, and when this was exhausted, Mrs. Donner died. But this story was not believed. It was remembered that Mrs. Donner was healthy and robust, and quite as capable of enduring privation as the survivor. It was found, too, that her remains indicated no signs of illness. From some stray remarks let fall by the Dutchman, the truth was finally guessed at; that he had murdered the husband, outraged and murdered the wife, and seized upon Donner's money. There were no not witnesses against him, however, and in this world he escaped the just punishment of his crimes; but he was compelled to surrender the money to the Donner orphans. Strong's Canyon (1668 m.), elevation 6780 feet. Summit (1671 m.), 7017 feet above the sea, the highest point of the railway, the highest point, except Sherman, reached as yet by the iron horse and the iron road in any quarter of the world. We are not, however, at the summit of the Sierra Nevada range, but only the elevation of the mountain-pass which the railroad closely follows. The prospect is one, nevertheless, unequalled for extent and grandeur. We stand on the watershed of several mountain-torrents which, after taking the most irregular and capricious fancies, and winding by rock and valley, pour their tribute at last into the one great receptacle of the Sacramento River. Towering mountain-peaks are all around, their brightness contrasting with the mysterious shadows of profound ravines; while the murmur of falling waters is on the ear, and ever and anon comes the flash of a mountain lake, like that of a diamond, set in an emerald ring. From the moment we reach the high ground of the Summit, the railroad strikes through a succession of tunnels and snow-sheds, so closely connected that for miles it seems all tunnel. The longest of these measures 1700 feet. "The snow-sheds," we are told, "are solid structures, built of sawed and round timber, completely roofing in the road for many miles. When the road was completed, there were 23 miles of shed built, at an annual cost of $10,000 per mile. With the additions since made the line reaches about 45 miles, which includes the whole length of the deep snow-line on the dividing ridge. When we remember that along the summit the snow falls from 16 to 20 feet deep during a wet winter, we can understand the necessity and importance of these structures. By this means the track is as clear from snow in the winter as in the valleys. The mighty avalanches which sweep down the mountain sides in the spring, bearing everything before them, pass over the sloping roofs of the sheds, and plunge into the chasms below, while beneath the rushing mass the cars glide smoothly along, the passengers hardly knowing but that they are in the midst of an enormous tunnel." Cascade (1677 m.), elevation 6519 feet. Here one of the branches of the Yuba leaps down the rocks in a pleasant waterfall, "where woods are green, and birds are many." Tamarack (1681 m.), elevation 6191 feet. Cisco (1684 m.), elevation 5939 feet. Here passengers stop for refreshment, or may amuse themselves looking about the little village of 400 inhabitants. Emigrant Gap (1692 m.), elevation 5229 feet. It was here the old pioneers' road crossed the mountain ridge, and then followed the declivity to the valley of the Sacramento. The road passed over the gap or ridge ; the railway passes under it. Alta (1707 m.), elevation 3612 feet. Opposite Alta, and at no great distance from it, lies the Grand American Canyon, one of the wildest and most magnificent ravines in the Sierra Nevada. The river is here confined between two perpendicular walls, each about 2000 feet in height, which are washed perpetually by the boiling waters, and leave not an inch of ground for the foot of the would-be explorer. From Summit Station, we may here observe, to Sacramento, the distance is 105 miles. Between these places the descent from a height nearly half as great as that of Mont Blanc to 56 feet about the sea-level has to be accomplished. The swiftness with which the train flies down this tremendous incline, and the suddenness with which it wheels round the curves, produce a sensation not to be reproduced in words. The line is carried along the edge of declivities stretching downwards for 2000 or 3000 feet, and in some parts on a narrow ledge excavated from the mountain side by men swung from the top in baskets. The speed under these conditions is well calculated to try even the steadiest nerves. And as we sweep past each rugged height and grisly precipice it is impossible not to be stirred in one's inmost soul by the grandeur of the moving spectacle. E quindi uscenimo a riveder le stelle." This may seem a purely poetical comparison ; but not so, there is a positive degree of truth in it for the man who looks at nature with intellectual eyes. We have been passing through a region of misery and desolation, whose chief features were alkali-dust and sage-brush. Afterwards, we were cut to the bone by the keen blasts coming down from the snowy heights of the sierras. Then came a sudden, a magical change ! Warm and genial airs breathed sweetly round us ; the sun went down towards the Pacific with a radiant pomp ; the azure canopy of heaven, free from mist or cloud, and studded with myriads of stars, seemed to glow with an infinity of the richest and most beautiful colours. We are told that no Italian air was ever balmier, no evening breeze in vineyard or olive grove more grateful to the senses, than the soft wind which greets us in our descent, which is tempered by the freshness of the distant ocean, and scented with the delightful perfumes of the neigbbouring plains. Dutch Flat, or " German Level " (1709 m.), elevation 3403 feet. The town, containing about 2000 inhabitants, is situated in a pleasant valley, surrounded by prolific orchards and blooming gardens. Colfax (1722 m.), elevation 2421 feet, This pleasant, neat, and decorous town contains about 200 houses and 1000 inhabitants. Clipper Gap (1733 m.), elevation 1759 feet. named after Goldsmith's " Deserted Village," but a lively town of 1000 inhabitants, with schools, churches, gardens, and orchards. Newcastle (1745 m.), elevation 969 feet. Pino (1750 m.), elevation 403 feet. Junction (1758 m.), elevation 163 feet. 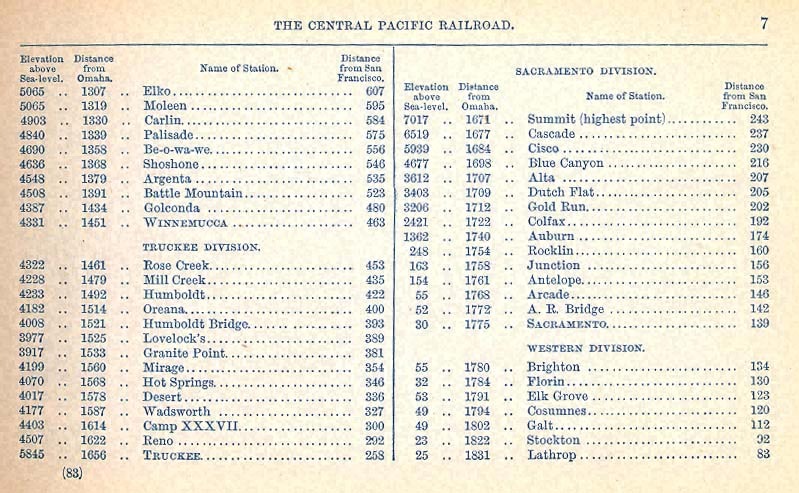 Here the Central is joined by the Sacramento and Oregon Railroad. Antelope (1761 m.), elevation 154 feet. SACRAMENTO (1775 m.), elevation 30 feet. Sacramento—the "capital of the Golden State," though not its principal town—is situated on the east bank of the Sacramento River, close to its confluence with the Great American River, and about 125 miles distant from San Francisco and the Pacific. It is now recovering from the effects of a terrible flood in the winter of 1852-53, and it forms the connecting link of so many important lines of railway that its future prosperity cannot be doubted. Besides the Central and its Western division, the California Pacific, and the Sacramento Valley and Placerville Railroads have each its terminus in this city. It is, in fact, the centre from which the various lines of travel radiate that embrace within their arms the wealth and natural wonders of California. Its population exceeds 50,000; probably is nearer 60,000. Its houses are mostly built of brick ; the streets are broad and well-paved ; while the trees which line them provide an agreeable shade in the summer which the visitor is sure to appreciate. It has its hotels, and its newspaper offices, and its well-supplied stores, its schools, its churches, and its charities ; as yet its public edifices are few, and of these the most noticeable one is the Capitol, or House of Legislature. This highly creditable structure is rendered conspicuous from every point of the surrounding plains by its huge dome, which is about 220 feet high (in the original plan), surrounded by pillars of iron, and crowned by an iron (purely it should have been a golden !) statue of California. In its general design, the building exhibits a facade of 320 feet. In the centre a huge flight of granite steps leads to a portico of ten columns. Enter ; pass through a large hall ; and you find yourself in the rotunda, the exact centre of the entire mass, and 127 feet in height. From this centre on each story a certain number of corridors with the State offices on either side. The wings forming the flanks of the buildings are 164 feet above the first or basement story. The north and south flanks form respectively the Assembly and Senate Chambers, the former measuring 82 feet by 72 feet, and the latter 72 feet by 62 feet. In the rear is thrown out a circular projection of 60 feet diameter for the State Library. Each of these apartments is 46 feet in height. The estimated cost of the entire pile is $1,600,000 in gold, of which three-fourths have already been expended; and from the condition of the building one is led to suppose that in Sacramento, as in other cities, original estimates are apt to be exceeded. It occupies an area of nearly 60,000 square feet, and measures upwards of 1200 lineal feet in circumference, including all the angles. Walk round it three times, and you will have "done" about a mile! The city is more of a dep0t than of a manufacturing centre. It contains, however, three flour-mills, two foundries and machine shops, a woollen mill, and a factory for making sugar out of beet-root. round-house, containing 28 stalls, with oil and water-tanks, and the great engine of 80 horse-power; store-house, hospital, and two Artesian wells.
" It is not necessary that any one should speak for Sacramento. I am no speaker, but Sacramento requires no speaker. There was a time, in the long ago of her history,* when every son of Sacramento was required to work, and act, and speak for her. But, thank God, that time has gone by ; the wheel of Time rolled on with a velocity that amazed and entranced, while it cheered and gladdened. The devastation of fire and flood swept over her, but she arose, phoenix-like, from her ashes, and the heart of every Sacramentan wells up with joy and gladness at the brilliant prospect of her future. The beautiful City of the Plains, nestling in her grandeur in the bosom of the valley, coquetting with the mountains and smiling on the sea, robed in republican simplicity, modest and unpretending, constantly growing in wealth and importance, cultivating a pure and enlightened Christian civilization, has attained a proud position among the cities of the Union. With her elements of greatness and grandeur, her gallant sons, her working-men, her cozy cottages, her stately mansions, her happy homes, her lovely daughters, her comely matrons, her churches and public schools, her looms and anvils, her mechanics and artisans, all speak in eloquent and thrilling tones of her present importance and future greatness. Her swift coursers of internal trade, whizzing through valley and canyon, over hill-top and mountain, rousing dreamy nature, and awakening glad echoes all over the land ; all—all attest her enterprise, and proclaim her the queen of the Golden State." It is not possible, perhaps, for our floweriest orators to anticipate too brilliant a destiny for this rising capital. It is already growing out of its early experiences. Few of the houses now are unsubstantial and temporary structures. We don't deny that here and there may be found a house or shop built of timber, but the principal materials used are stone, brick, and iron. Many of the more recent erections are both solid in construction and handsome in appearance. And the mansions, villas, and stores springing up in every direction fully confirm our assertion that it is a " rising capital." The Chinese constitute a considerable proportion of the lower classes of the population. They are industrious, temperate, and frugal; and though some of us don't like to see a Chinese immigration on a too extensive scale, we don't feel towards them as the Irish and the Negroes do, who regard them with looks of " high disdain." Their labour, however, seems to have become indispensable. Brighton (1780 m.), elevation 55 feet, 5 miles from .Sacramento, a small station of no interest, rejoicing in a name which always puzzles the traveller. The scenery round about it, so far as we could judge, has Do peculiar attractions. Florin (1784 m.), elevation 32 feet, 9 miles from Sacramento, is a very insignificant station, but it is situated in a valley which is by no means insignificant; a valley glowing with almost every beauty Nature could lavish on her most favoured spot. Elk Grove (1791 m.), elevation 53 feet, 16 miles from Sacramento. Cosumnes (1794 m.), elevation 49 feet, 19 miles from Sacramento. Galt (1802 m.), elevation 49 feet, 27 miles from Sacramento. Mokelume (1808 m.), elevation 55 feet, 36 miles from Sacramento. point for the Yosemite Valley and all its wonders. Wilson's or Lathrop (1831 m.), elevation 25 feet. San Joaquin Bridge (1834 m.), elevation 36 feet. Banta's (1838 m.), elevation 30 feet. Ellis (1843 m.), elevation 76 feet. Medway (1848 m.), elevation 357 feet. Pleasanton (1869 m.), elevation 351 feet, 40 miles from Sacramento. Niles Junction (1880 m.), elevation 86 feet. Decota (1886 m.), elevation 71 feet. Lorenzo (1895 m.), elevation 32 feet. San Leandro (1897 m.), elevation 48 feet. Alameda (1905 m.), elevation 18 feet. A remarkably fertile country. Population of the town, which is surrounded by noble groves of oaks, 1500. We now arrive at OAKLAND, the terminus of the railway, 1911 miles from Omaha and 3212 miles from New York. It is situated on the eastern shore of the bay, and connected with San Francisco by a ferry. It boasts of churches, schools, newspaper offices, warehouses, villas, orchards, vineyards, and glorious wooded uplands. Moreover it has a population of nearly 8000. 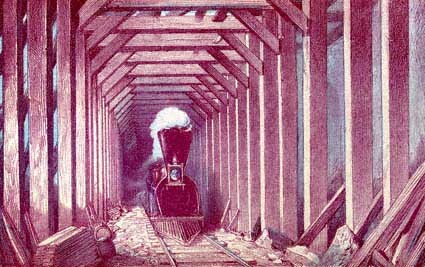 The Railroad Company have recently constructed an immense pier, projecting far out into the bay, and the trains running down to its extremity, passengers and baggage, are deposited on board the Mammoth Steam Ferry-boat, and conveyed across the bay to San Francisco in about twenty minutes. The pier is upwards of 9000 feet in length, with double track and carriage way, and projects into the bay to a point which is within 3000 feet of Goat's Island. At the end of the pier are five slips in course of construction; the first, on the right, is 600 feet in length, and will accommodate the largest ships in the world, the water being 24 feet deep at low tide. On each side of the slip warehouses are being erected, 600 feet long, and 75 feet wide, with tracks running through, for the purpose of loading or discharging. The officials connected with the pier will tell you that it was completed last year (1870), and that on the 4th of August the first ship began loading here,—an English ship, the Jenny Eastman,—which conveyed a cargo of wheat to Liverpool ; the wheat having been partly brought from San Joaquin Valley, but most of it from the country about the terminus of the California and Oregon Railroad—in other words, about 250 miles from San Francisco. This fact points out the future destiny of the city, when it shall be universally known that it is the great corn dep0t of Western America ; that Chinese, and Japanese, and Indian, and Australian vessels can lie alongside this pier, loading from and unloading into the cars of the great Continental Railroad ; the same cars, on their arrival at Omaha, being duly sent through to New York, or any other city of the Union, without change; and the whole transit being accomplished in less than one-fourth of the time previously occupied. 3539 miles from Boston ; 3215 miles from New York ; 3230 miles from Philadelphia ; 1914 miles from Omaha; and 139 miles from Sacramento. Hotels.—The Grand Hotel (very good), Cosmopolitan, Occidental, Lick House, Russ House, American Exchange, Brooklyn, International. Newspapers.—Alta California, Bulletin, Morning Call, Golden City, Sunday Mercury, California Farmer, &c.
Theatres.—California, the Alhambra, the Metropolitan, and the Opera House. Libraries.—The Mercantile, the Odd Fellows', and the Mechanics'. Places to be seen.—The Markets; the Mechanics' Pavilion, Geary Street ; the Dry Dock (465 feet by 125 feet, and 40 feet deep), at Hunter's Point; the Branch Mint, Commercial Street ; the Defences at Fort Point, Marle Point, Angel Island; the Protrero Ship-yards; the Twin Peaks, 1200 feet high; Clay Street Hill, 420 feet; Russian Hill, 350; Telegraph Hill, 300 feet. Principal Streets.—Market Street, Commercial Street, Montgomery Street, the Plaza, Washington Square and Street; California Street, Kearney Street, Clay Street. The " Golden Gate " was discovered by that famous Elizabethan seaman, Sir Francis Drake, who was so attracted by the beautiful features of the surrounding country, that he called it " New Albion. "Before we went from hence," says the chronicler of his circumnavigation, "our general caused a post to be set up on shore, a monument of our being there; as also of her Majesty's and successor's right and title to that kingdom—namely, a plate of brass, fast nailed to a great and firm post, whereon is engraven her grace's name, and the day and year of our arrival there, and of the free giving up of the province and kingdom, both by the king and people, into her Majesty's hands; together with her highness's picture and arms in a piece of sixpence, current English money, showing itself by a hole made of purpose through the plate." The harbour in which he had found shelter he named the Port of Drake; and the English Admiral Burney identifies it with that now known by the name of Port San Francisco, in lat. 37° 48' 3" north. The latitude given by the old writer is 38° north—quite near enough for our early navigators. Burney remarks: " Allowing them to be the same, it is remarkable that both the most northern and the most southern ports at which Drake anchored in the course of his voyage, should afterwards, by the Spaniards, doubtless without any intended reference to the name of Francis Drake, be named San Francisco." "If California ever becomes a prosperous country, this bay will be the centre of its prosperity. The abundance of wood and water, the extreme fertility of its shores, the excellence of its climate, which is as near to being perfect as any in the world, and its facilities for navigation—affording the best anchoring grounds in the whole western coast of America—all fit it for a place of great importance." This was written in 1840; thirty years later, the wooden shanty was replaced by the mansions of a wealthy city, numbering a population of 170,000 souls. As for California itself, Fremont conquered it from the Spanish Americans in 1846, with forty-two men, and it has now a settled population of nearly 500,000. Of modern San Francisco—though, by the way, it is all modern—let us try to glean a few particulars, to refresh our memory on our return home. Perhaps we may admit that, so far as building facilities are concerned, the town is not very conveniently situated. The reader, if he knows anything of its history, will remember that when the first houses were built in 1845 and 1846, they stood on a strip of beach, overlooking the sheltered cove of Yerba Buena, and at the foot of the steep and lofty sand-hills. But the hills and the coves have all vanished long ago; the landslips have projected far into the bay, and the former harbour is now the business quarter of the city. It is true that a great town was never erected under heavier difficulties; but it is also true that, for commercial purposes, it is exactly in its proper locality. Vallejo and Benicia, which latter gave birth to the " Benicia Boy," at one time ran San Francisco pretty closely. While the site now embellished by the " Queen City" was occupied by the few straggling houses of Yerba Buena, the then Francisco (or Benicia) was a growing city, with a good deal of capital and labour in it. Then came the rush to the gold mines; Yerba Buena became a great city, and took to itself the name of its great bay ; while Francisco, in order not to be confounded with San Francisco, humbly adopted the designation of Benicia. It was at one time supposed that the mouth of the Columbia would become the great harbour on the western coast; but the " centre of the universe " has not more completely removed from Independence to Fort Riley than the port of the Pacific has shifted from Astoria to San Francisco. We cannot conceal from ourselves that it shares, with all other cities along this coast, the great danger of earthquakes. It is recorded that, three times within the present century, the spot on which San Francisco stands has been " violently disturbed " by subterranean forces. An English traveller, who a few years ago was taking notes in this direction, observed that San Francisco, like all American cities, is inhabited by a crowd of men of all lands beneath the sun. He says that New Englanders and Old Englanders predominate in energy, and the Chinese in numbers; and we don't think he is far wrong. The Union is open to the whole world, and can shelter a great part of it! He goes on to remark, with great acuteness, that the French and Italians are stronger here than in any other city in the States; while the redskinned Mexicans, who own the land, supply the market people and a portion of the townsfolk. Australians, Polynesians, and Chilians are numerous ; the Germans and Scandinavians alone are few,—they prefer to go where their friends are already located—to Philadelphia or Milwaukee. In this city, already a microcosm of the world, the American, English, and Scotch are in possession, have distanced the Irish, beaten down the Chinese, and are destined to physically preponderate in the cross-breed, and give the tone, political and moral, to the Pacific shore. New York is Irish, Philadelphia is German, Chicago Canadian, Sault de Sainte Marie French ; but in San Francisco, where all the foreign races are strong, it cannot be said that any is dominant. The fertility of the country round the bay is really marvellous. It is as rich as it is beautiful. The valley is dotted with snug farms and picturesque cottages, embowered in groves, and gardens, and orchards. In the summer, when the orchards and the vineyards are loaded with fruit, who could wish to look out upon a fairer scene! Thus, in Sonora, one of the counties that open out on the bay, vineyards have been planted on a most extensive scale, and the valley is being rapidly converted into one great granary of fruit. The product of the Californian vineyards may now be estimated at nine to ten million gallons of wine. A great quantity is sent to New York and Chicago ; while wheat is very largely exported to England. manufactures, we need only say that they an established on a superior scale, and conducted with the utmost energy and enterprise. known Protestant denominations possess their own places of worship; but the churches of the Episcopalians are the most beautiful and attractive, and the Episcopalians themselves form the most numerous body. born Californians will hereafter be fine specimens of humanity. Here we complete our description of that astounding monument of our energy and enterprise, the great Continental Railroad, which holds together in an iron grasp the east and west coasts of the New World. Click here for the Chromolithographic Illustration index. 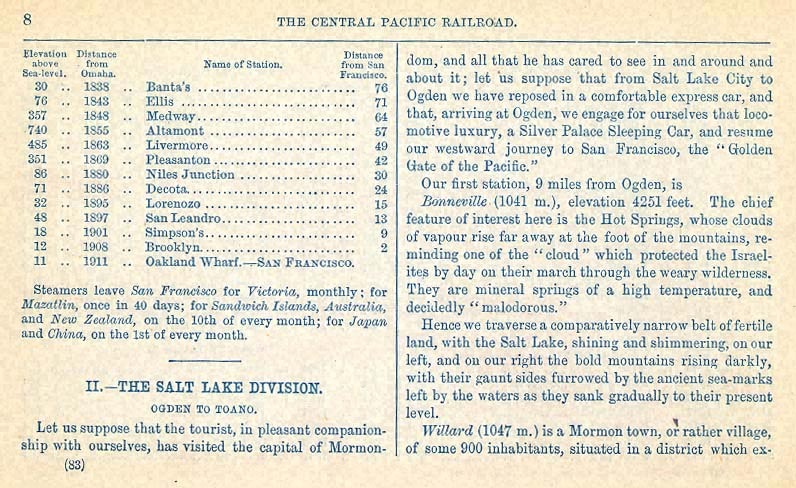 There are three Nelson guide books that are related to the U.S. first transcontinental railroad — "The Central Pacific Railroad: A Trip across the North American Continent from Ogden to San Francisco" (reproduced above), a companion volume "The Union Pacific Railroad: A Trip Across the North American Continent from Ogden to San Francisco", and a third volume "Salt Lake City with a Sketch of the Route of the Central Pacific Railroad, from Omaha to Salt Lake City, and Thence to San Francisco." There are other Nelsons Pictorial Guide Books in a similar oblong 12mo. format each with about a dozen chromolithographs (sometimes distributed through the text, and sometimes with color illustrations all following the text); the covers very in color and some copies have small colored illustrations bearing the shortened title pasted on the front cloth cover. These include: "Yosemite Valley, and the Mammoth Trees and Geysers of California"; "Views of Jeruselem" (1868); "The Isle of Wight" (1859); "The Crystal Palace" (c.1867); and, "Falls of Niagara." Links are not merchant endorsements.